You don’t have to go far out of Austin to view the stars at night. Westcave Preserve, located about 40 miles from downtown in southwestern Travis County, is a 75-acre gem managed by the non-profit Westcave Preserve Corporation. Go west on Hwy 71 and then about 14 miles on Hamilton Pool Road. Cross the Pedernales River, and you’ll find the perfect dark spot for viewing night skies without interference from city lights. If you’re an amateur astronomer—or just fascinated by heavenly bodies—don’t miss upcoming “Star Nights” on Saturday, April 16 and May 14, weather permitting. Call 830-825-3442 to register, or email info@westcave.org. Westcave Preserve is an ecological treasure of the Texas Hill Country. On guided tours held every Saturday and Sunday, visitors traverse a diverse environment—dry grasslands, limestone crevice, and spectacular sheltered canyon filled with lush plant life. 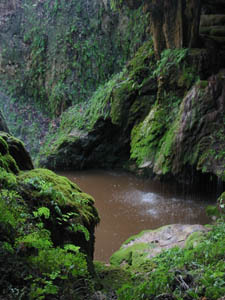 Westcave stands at the head of the canyon which features a waterfall tumbling 40 feet over fern-covered travertine to an emerald pool below. The hike covers less than one mile round trip and takes about one hour and 45 minutes. Tours are scheduled at 10 a.m., noon, 2 p.m., and 4 p.m. Reservations are not accepted on weekends, so plan to be among the first 30 people arriving for your preferred tour time. During the 1960s and 1970s, when Westcave Preserve was privately held, picnickers and trespassers trampled the site damaging fragile flora and breaking stalagmites and stalactites in the cave. Since 1983, the site has been owned by the Lower Colorado River Authority, which leases the preserve for $1 per year to the corporation for management purposes. Allowing guests to visit the grotto area only on a tour helps minimize human impact on the sensitive site. In addition to daytime nature hikes and nighttime astronomy events, the Preserve also offers an array of natural science and interdisciplinary educational programs for children and adults at the Warren Skaaren Environmental Learning Center. Exhibits illustrate how the forces and cycles of nature have interacted to create and sustain this unique sanctuary. The Dark Sky exhibit explains the importance of and ways to protect the unlit sky as a natural resource. Star nights are an ideal opportunity for families to recognize this declining feature while gazing at the heavens through a high-quality telescope. Other reasons to visit: grasslands sprout wildflowers in the spring, and the sheltered limestone canyon is filled with rare plants and cypress trees. The site is nationally recognized as one of the region’s premier places to view the endangered golden-cheeked warbler.